At Mass last weekend 72 + 70 + 101 = 243. Thank you for your contribution of £535.66 + £309 = £844.66. The Life group is looking for baby clothes and/or equipment to provide help to families in our area who are struggling to provide for their babies. Please leave your donations in either church - the basket at Christ the King and Box at St. Margaret Mary. Parents who would like their children to make their First Holy Communion this year are invited to a meeting on Thursday 16th February at 6.00 pm in St. Margaret Mary Church to enrol their children in the programme. First Holy Communion will be cerebrated on Sunday 25th June during the 11.00 am parish Mass. Application forms are available for young people [Year 6 and above] to apply for this sacrament. Please return to Fr Michael by 19th February. Once numbers are known, we will apply to the bishop for a date for the celebration and begin preparation. A reminder to parents that we are now accepting applications for 3 year olds for Nursery for April 2017. The deadline for applications is 15th January 2017. Please contact School on 01228 401800 for a form. Please return Red Mission Boxes to be emptied between now and the end of January - many thanks. Will resume at Christ the King after Half Term [Sunday 5th March]. It is a noble Catholic Tradition to have Masses celebrated for the intention of our loved ones who have died but also for the living - friends and family members who are in need of prayers [for example on the occasion of a birthday, new job, seeking employment, travelling, illness]. The process for requesting this is simple. Envelopes are available in both churches. All you have to do is write the name of the person or intention, give a date when you would like this to be celebrated and enclose a donation - a ‘stipend’ - and then hand in to the priest. The priest is obliged to celebrate that Mass within a year - if he is unable to fulfil this himself he sends the intention to Missionary or other priests in need of such stipends. It is optional to have a ‘Mass Card’ signed if you want the person to know that Mass is being celebrated for them - a range of Mass cards are available to purchase in both churches. You are allowed to ask to have Masses celebrated for your own intention - St. Anselm said “A single Mass offered for oneself during life may be worth more than a thousand celebrated for the same intention after death.” This can be done as a ‘Special Intention’ or ‘Private Intention’. When was the last time you asked for Mass to be offered for a particular intention? Why not make this request this week? Let’s restore the Mass to the true centre of our faith by living out this powerful tradition of the Catholic Faith. Let’s ‘up our game’ in 2017. In February we will have a new opportunity to learn more about our faith using Bishop Robert Barron’s Catholicism series. Bishop Barron is on a new journey to unlock the truth behind the Catholic Church's most influential people. CATHOLICISM: The Pivotal Players is a multi-part film series that illumines a handful of saints, artists, mystics and scholars who not only shaped the life of the Church but changed the course of civilisation. The series will be held fortnightly on Tuesday evenings in the Parish Centre after Mass. Optional personal study material will be available to take away. More information over the coming weeks. 7.30 pm, a Polish prayer group gather at Christ the King church. Prayer for adults in the church and children in the parish room. All welcome. Sr Gerald & Sr Maureen invite you to join them each week to pray for a change of heart for the people of violence in Syria and for their victims. Mondays 6.00 - 7.00 pm. We hope to relaunch the Youth Group in the Spring - when the nights are a bit less dark. All are welcome on the first Friday of the month, Friday 3 February 8.00 - 9.30 pm, St Gabriel’s convent chapel, 52 Victoria Place Carlisle CA1 1HP. For more information, please contact Monica Greaves on greaves_monica@yahoo.co.uk. 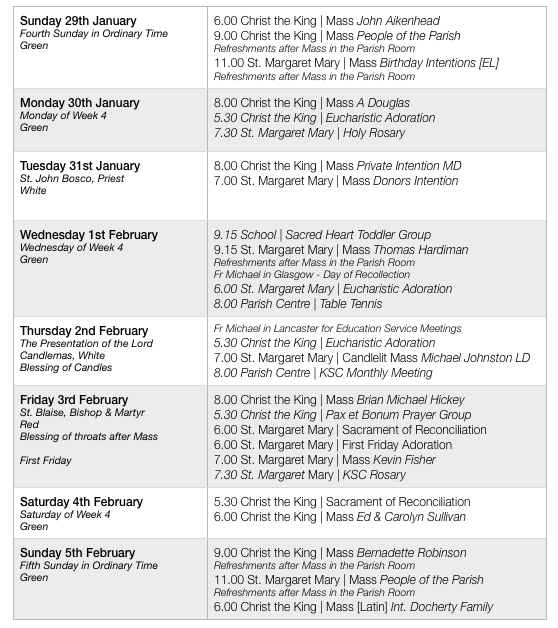 Mass will be celebrated in the Extra-Ordinary Form [Latin, 1962 Missal] on Sunday 5th February at 6.00 pm at Christ the King. 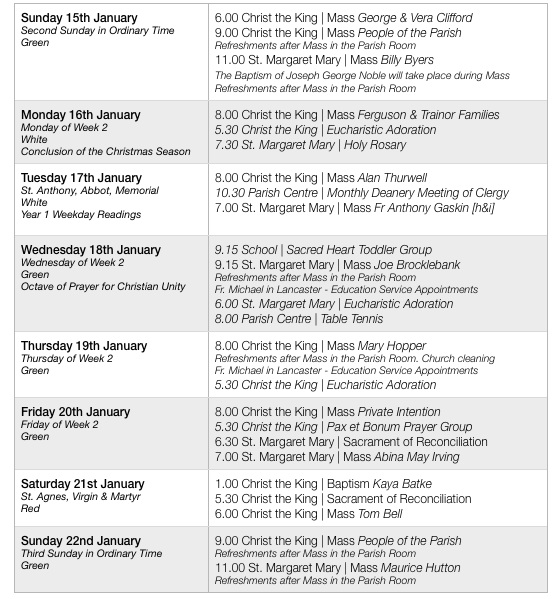 The Mass will be a Missa Cantata - a sung Mass of the 5th Sunday after Epiphany [using the old calendar]. All are welcome and this Mass fulfils the Sunday obligation. At Mass last weekend 75 + 67 + 146 = 288. Thank you for your contribution of £441.50 + £249.45 = £690.95. 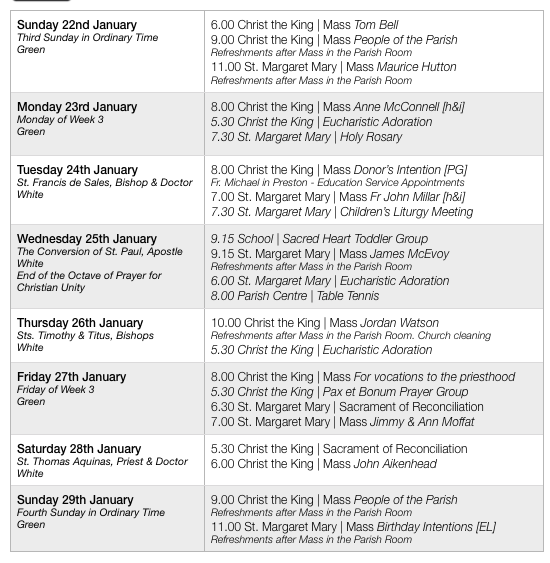 There will be no Children’s Liturgy of the Word at Christ the King for the time being. Thank you to those who have offered to help - there will be a training evening for all who assist with this ministry and anyone new who would like to help on Tuesday 24th January at 7.30 pm at St. Margaret Mary’s [after the evening Mass]. In February, we will have a new opportunity to learn more about our faith using Bishop Robert Barron’s Catholicism series. Bishop Barron is on a new journey to unlock the truth behind the Catholic Church's most influential people. CATHOLICISM: The Pivotal Players is a multi-part film series that illumines a handful of saints, artists, mystics and scholars who not only shaped the life of the Church but changed the course of civilisation. The series will be held on Tuesday evenings in the Parish Centre after Mass. Optional personal study material will be available to take away. More information over the coming weeks. Our annual Diocesan pilgrimage celebrates its 90th anniversary this year and travelling with the Youth Service is a great way for young people to get to know the story of Lourdes and grow in faith through service, prayer, catechesis and time spent with other young Catholics. Open to ages Year 11+, prices from £650 for coach travel. (Flight information will follow.) 19th - 29th July. Book now, forms are on our website - http://www.castleriggmanor.co.uk/yatm-events/lourdes-2017. Sr Gerald & Sr Maureen invite you to join them each week to pray for a change of heart for the people of violence in Syria and for their victims. Mondays, 6.00 - 7.00 pm. Baker/cook URGENTLY WANTED for a patient support charity. Headway North Cumbria is a charity offering support and rehabilitation activities to those with acquired brain injury. Each Monday afternoon, 1.00 - 4.00 pm, they provide services in a social and creative environment at the Waterton Hall, OL&SJ, including games, arts and craft and cooking/baking. The charity has recently lost the services of their cook and they are appealing urgently for a volunteer with cooking and/or baking skills to assist during their sessions enabling those injured through brain injury to re-acquire basic skills in meal preparation within a happy and fun environment. If you think you can assist, please contact Andrew Kirkpatrick on 07776-341045. All are welcome on the first Friday of the month, Friday 3 February, 8.00 - 9.30 pm, St Gabriel’s convent chapel, 52 Victoria Place Carlisle CA1 1HP. For more information, please contact Monica Greaves: greaves_monica@yahoo.co.uk. Thank you for £815 received recently from parishioners at St. Margaret Mary and an additional £113.10 from Christ the King. The next fund collection will be the weekend 28th/29th January. At Mass last weekend 70 + 75 + 84 = 229. Thank you for your contribution of £493.70 + £259.40 = £753.10. Could all extra-ordinary ministers of Holy Communion who take Holy Communion to the sick and housebound, please provide Fr. Michael with an up-to-date list of the people you visit, with their addresses. Many thanks in anticipation. The annual figures for the food bank for 2016 show a rise in the number of food parcels each month (averaging 465 per month). Please continue to place items in the basket in the porch at Christ the King. It is a noble Catholic Tradition to have Masses celebrated for the intention of our loved ones who have died but also for the living - friends and family members who are in need of prayers [for example on the occasion of a birthday, new job, seeking employment, travelling, illness]. The process for requesting this is simple. Envelopes are available in both churches. All you have to do is write the name of the person or intention, give a date when you would like this to be celebrated and enclose a donation - a ‘stipend’ - and then hand in to the priest. The priest is obliged to celebrate that Mass within a year - if he is unable to fulfil this himself, he sends the intention to Missionary or other priests in need of such stipends. It is optional to have a ‘Mass Card’ signed if you want the person to know that Mass is being celebrated for them - a range of Mass cards are available to purchase in both churches. In February we will have a new opportunity to learn more about our faith using Bishop Robert Barron’s Catholicism series. Bishop Barron is on a new journey to unlock the truth behind the Catholic Church's most influential people. CATHOLICISM: The Pivotal Players is a multi-part film series that illumines a handful of saints, artists, mystics and scholars who not only shaped the life of the Church, but changed the course of civilisation. The series will be held on Tuesday evenings in the Parish Centre after Mass. Optional personal study material will be available to take away. More information over the coming weeks. On Friday evenings between 5.00 pm and 7.30 pm, a Polish prayer group gather at Christ the King church. Prayer for adults in the church and children in the parish room. All welcome. Fr Michael will be hosting an ‘At Home’ and would welcome all those who help out in the parish for drinks and nibbles - readers, welcomers, flower arrangers, the KSC, SVP, servers, extra-ordinary ministers of Holy Communion, cleaners, sacristans, collectors, children’s liturgy, singers, musicians, teachers, members of the parish council and parish finance committee to the Presbytery on Sunday 8th January between 4 .00 pm and 6.00 pm. Please come along. Thank you for your contribution to this collection - £172.26. This year, your donations at the crib on the sanctuary will go to the ecumenical charity, Friends of the Holy Land. Your donations will help support the poorest Christian families in and around Bethlehem, the West Bank, Gaza and Israel, with employment, education, health and housing initiatives. FHL is both apolitical and ecumenical. Visit www.friendsoftheholyland.org.uk. Thank you for £368.00 received from parishioners at Christ the King. Figures for St. Margaret Mary were not available at the time of going to print. At Mass last weekend 85 + 52 + 84 = 221. Thank you for your contribution of £401.90 + £229.78 = £631.68. Cumberland Infirmary Chaplaincy — Can You Help? The ecumenical Voluntary Chaplaincy at the Cumberland Infirmary seeks more Catholic support. Fr Jim Allen, our Catholic Chaplain, envisages a commitment of about two hours weekly, variable according to availability. Support will be provided. Please speak to Sr. Maureen if you are interested in this opportunity. 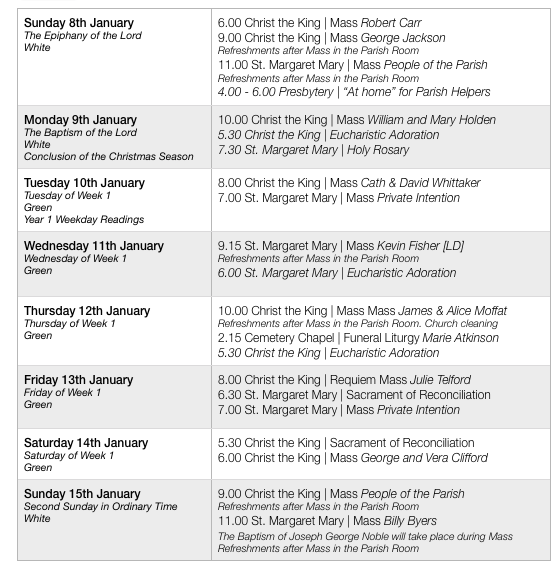 With the approval of Bishop Michael Campbell, Mass will be celebrated in the Extra-Ordinary From [according to the Missal of 1962] on the First Sunday of each month at 6.00 pm in Christ the King Church. This will begin on Sunday 5th February 2017. This is as a result of recent clergy moves in Carlisle and the need to serve the pastoral needs of those attached to the Extra-Ordinary Form in accordance with the Motu Proprio, Summorum Pontificum. Anyone is welcome to assist at this Mass which fulfils the Sunday obligation to attend Holy Mass. Could all extra-ordinary ministers of Holy Communion, who take Holy Communion to the sick and housebound, please provide Fr. Michael with an up-to-date list of the people you visit, together with their addresses. Many thanks in anticipation. Help is needed with the Children’s Liturgy of the Word during Mass on a Sunday morning where we currently have only one volunteer assisting our young people. Are you willing to help? If no one comes forward to help, this will cease at Christ the King. Are you a doctor, nurse, hospital chaplain or other healthcare professional? … needing a restorative break? … interested in connecting work and faith? The Augustinian Sisters invite you to join them, 9-14 January at Boarbank Hall, Grange-over-Sands.For further details, please visit www.boarbankhall.org.uk/events. Each year since 1954, members of parishes in Carlisle and district have joined together and gone on pilgrimage to the National shrine of Our Lady of Walsingham in Norfolk. The pilgrimage in 2017 will be Tuesday 18 - Friday 21 April. Cost £250, which includes accommodation, most meals, tips and coach travel. For more information, please contact Jo Muter on 524087 or email: jemuter47@gmail.com.